As Washingtonians retreat to escape the chilly Washington DC weather, All Pro Chimney brings warmth into their homes by installing high-quality fireplaces and hearths. As a locally-owned small business, our goal is to please our customers with the best service and products at affordable pricing. All Pro Chimney is the right choice for fireplace installation in Washington DC. About 90% of the heat generated from traditional wood-burning fireplaces goes up and out of their chimnies. All Pro Chimney’s lineup of heat-saving gas, wood-burning or pellet stove inserts are the solution. We merely install energy efficient metal fireplace inserts in existing masonry fireplaces. Fireplace inserts keep the heat in and retain the traditional fireplace look. If you want increased efficiency and less maintenance together with real flames, installing a pellet stove insert is a great option. Pellet stoves burn pellets made from compressed wood and are easier to use than wood burning fireplace inserts. Several of our pellet stove models can heat an area up to 2,000 sq. Feet! Do you prefer lots of heat and efficiency without the mess of wood or pellets? With gas fireplace inserts, you get more efficient heating without sacrificing the look of a traditional masonry fireplace. And you can flip the system on at a push of a button. All of our gas fireplace inserts come with blower, remote, and thermostat options. A mainstay in our amazing heat-saving lineup is the wood burning insert — just good old-fashioned comfort and efficiency. Depending on the model, these inserts can heat between 500 and 3,000 square feet and are rated at 70% plus efficiency. With this kind of power and ability, you can heat up a room or an entire home! Sometimes your masonry fireplace is located in the wrong room. In other cases, you want to add the comfort of a fireplace to an additional room. Freestanding fireplace models let you enjoy the convenience of a fire in any room. Freestanding pellet stoves are becoming more popular than wood stoves because they require less maintenance. Simply reload the hopper with pellets and enjoy 50 or more hours of use. Several models are equipped with thermostats and turn on automatically. All Pro Chimney’s freestanding gas stoves are the choice for those who want lots of heat and efficiency with less maintenance. Most of our freestanding gas models are at least 70% efficient and have blower and remote options. Bring affordable, easy-to-use heating into any space. If keeping the authentic look of burning wood while saving on the heating bill are your priorities, freestanding wood stoves deliver. Enjoy cost-effective heating without sacrificing tradition. Our prefabricated wood-burning and gas fireplaces add an essential element to a family living room. Prefabricated fireplaces are pre-assembled and constructed of metal. As a result, prefabricated fireplaces can be installed at costs that are significantly lower than masonry fireplaces. They are also more energy efficient. 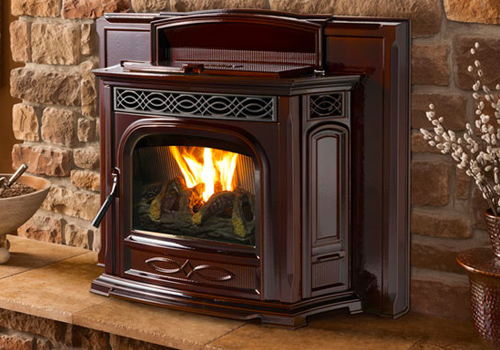 We carry top brands, including Heat Glo, Heatilator, Regency Fireplace Products, and Superior Fireplaces.